This is the third kinetic sand recipe we tried and I think this one might be my favourite? 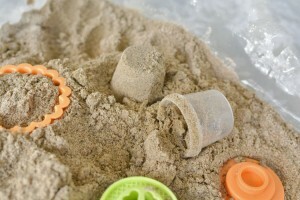 (Although I really enjoyed the moldable play sand recipe we made as well.) 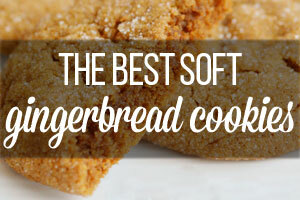 The recipe in this post ends up having a great texture, and of the three recipes we tried, this one had the closest texture to the kinetic sand you see in stores. 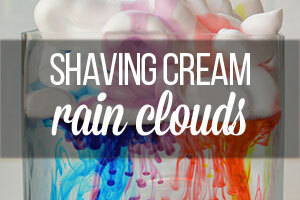 The only down side is that it dries out after a day of play and you have to add more water to keep it going. I think what I’ve learned from making all of these different play sands is that you have to tweak the ingredients for the type of sand you have. All play sand is slightly different, so if your sand isn’t behaving how you’d like it to, you’ll need to increase (or decrease) the quantity of liquid to bring it to a texture you like. 1. 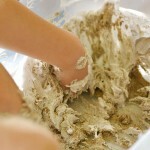 Shaving Cream Sand Foam using Shaving Cream and Sand – Make this one if you want a cool sensory foamy experience, but not necessarily the most squishiest, moldable sand. 2. 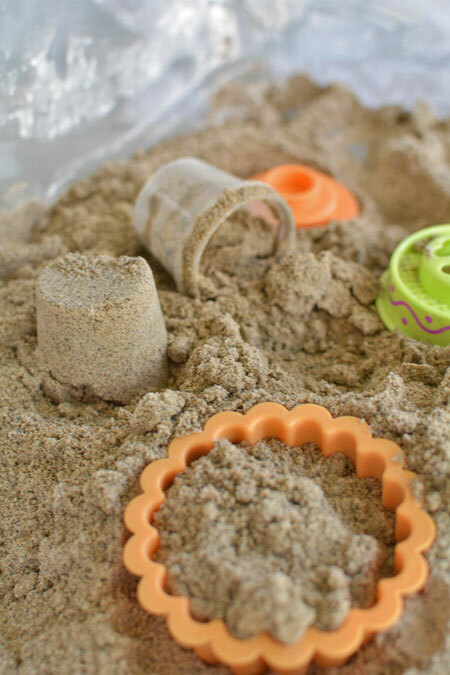 Moldable Play Sand using Flour and Oil – Make this one if you want soft, moldable sand that you can play with over and over again without needing to add more liquid. 3. 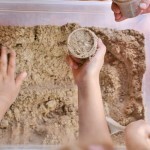 Kinetic Sand using Corn Starch and Dishsoap – Make this one if you want play sand with a texture closest to the kinetic sand in stores, but you don’t mind adding water after it dries out. 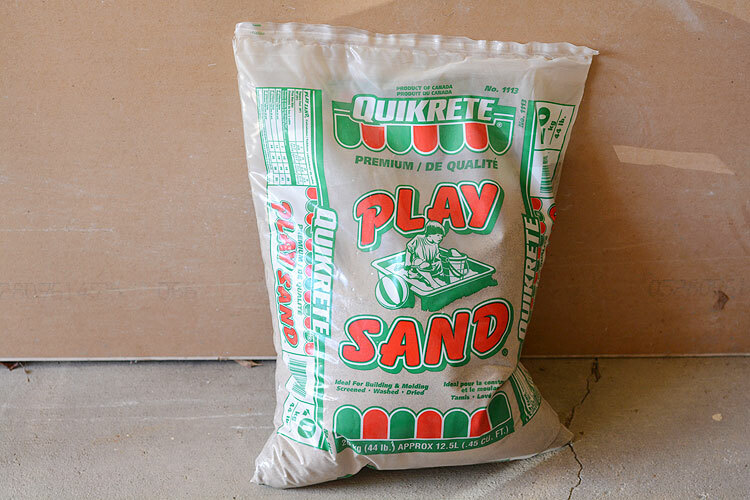 This is the 44 lbs bag of sand we bought at Home Depot for about $5. It’s a lot of sand! 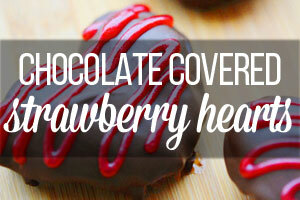 I’ve already tried three recipes with it, and there is still about 3/4 of the bag left! I guess I’ll need to come up with some more sand activities! 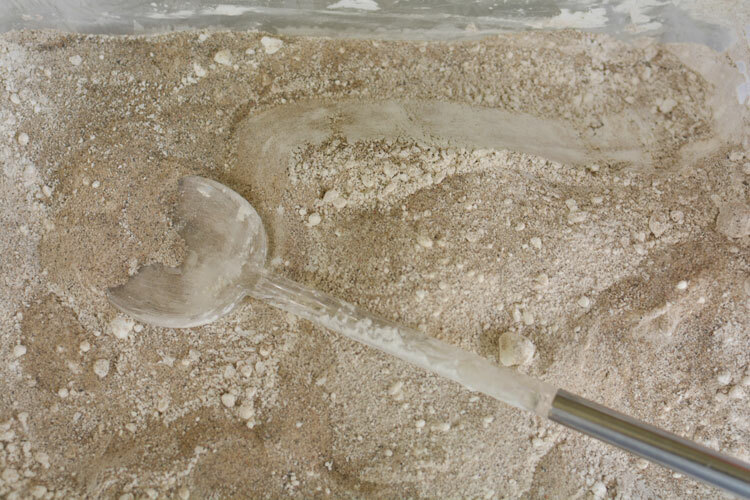 This recipe is interesting because it combines the unique characteristics of cornstarch and water, with the moldable characteristics of sand. You know how when you mix cornstarch and water it’s not quite a liquid and not quite a solid? Adding it to the sand kind of gives the it a bit of a “quicksand” quality, especially when you add more water to it. 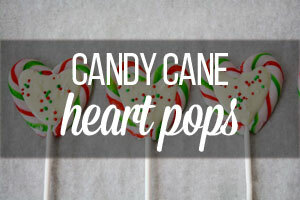 This recipe uses water, corn starch and dish soap (the full recipe is at the bottom of this post). The soap is what gives it the fun squishy texture. Mix together the sand and corn starch. 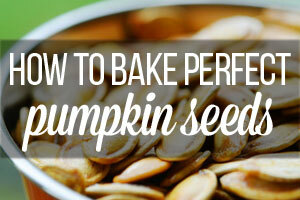 It will make it easier to combine when you add the water and will prevent lumps if you pre-mix the dry ingredients. 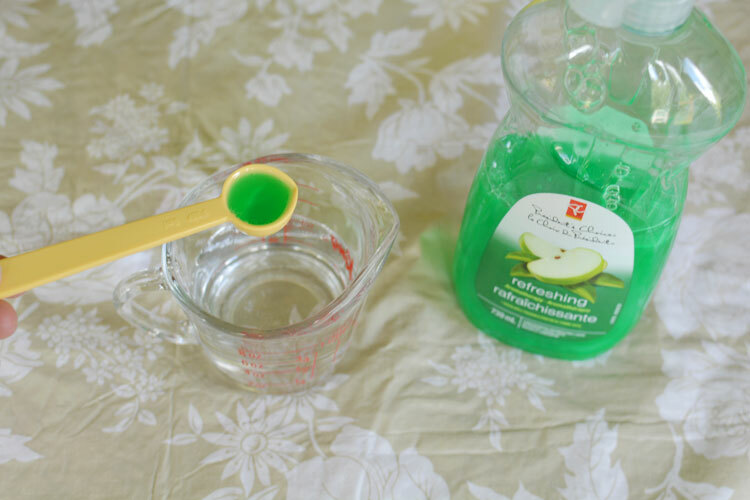 Add the dish soap to the water in a separate container and stir until it’s well mixed and a little bubbly. Then add the water and soap solution to the sand and corn starch mixture. Stir it up until it’s well mixed. 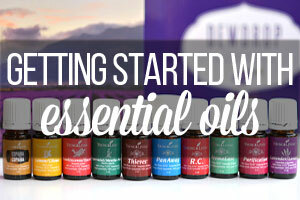 If it looks a little too dry, feel free to add some more water until it gets to a consistency you like. This stuff had a great texture! It was easily moldable, and I would say it behaved a lot like the kinetic sand you see in stores. Out of the three recipes we tried, this one was probably the best, with the oil and flour moldable play sand being a close second. 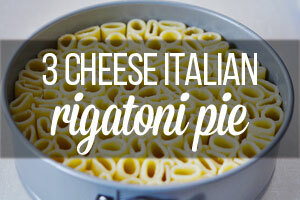 The only problem with this recipe was that by the end of the day, it had completely dried out. Which I guess is either a good or a bad thing, depending on how you look at it. If you put it away after it has dried out, it will store so much better and all you’ll have to do is add the water back when you are ready to play with it again. Here’s a comparison of all three recipes that we tried. 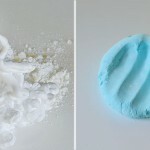 The top photo is the flour and oil moldable play sand, the middle photo is the shaving cream foam sand and the bottom photo is the kinetic sand recipe in this post. 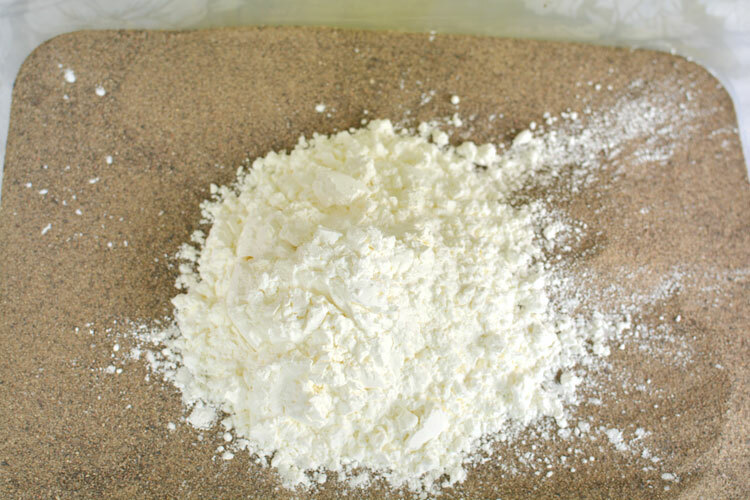 Add the corn starch to the play sand and mix together until it's well combined. 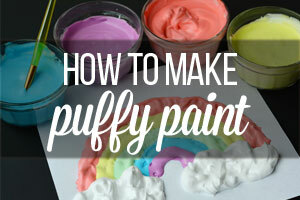 Mix together the dish soap and water in a separate container until it's fully mixed and a little bit bubbly. 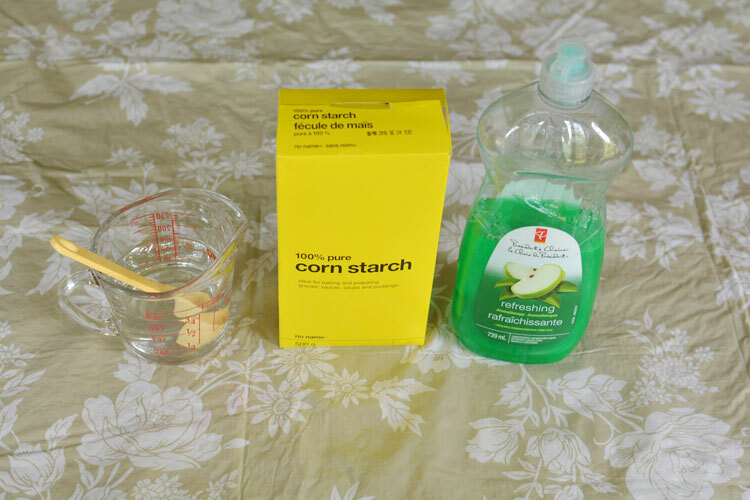 Add the water and dish soap solution to the corn starch and play sand mixture and mix until it's well combined. 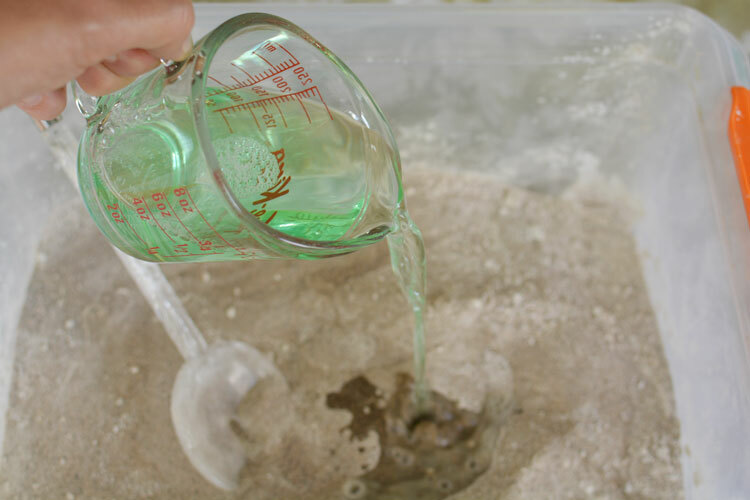 If the sand seems too dry, slowly add more water until it reaches a consistency you like. We took all of the bins outside and played with them on the patio. (*cough* ignore the weeds in the patio *cough*). 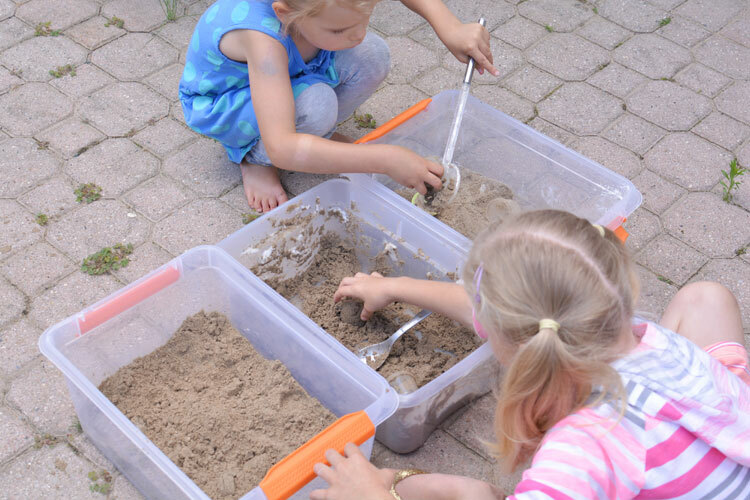 The kinetic sand recipe in this post is the box on the right in the photo below. It was a warm day, so it started to dry out quickly. 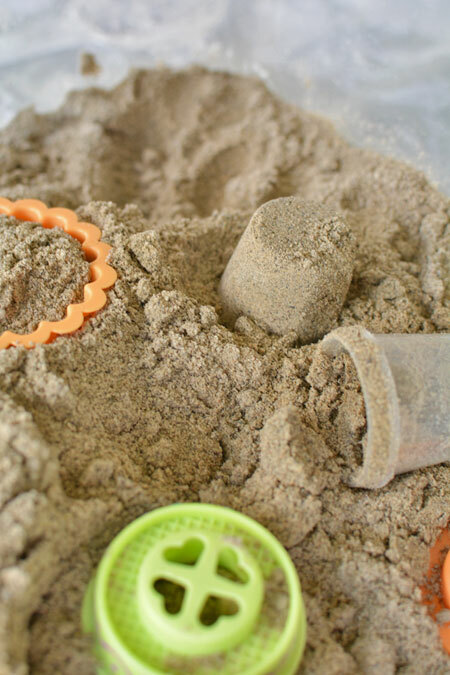 This kinetic sand recipe uses ingredients you probably already have at home. 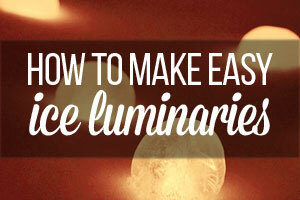 It’s easy to mix it all together, and it ends up with a really cool squishy and moldable texture. If it dries out, add more water and if it loses it’s squishiness, add another squirt of dish soap to bring it back to life. When you are done playing, let it dry out, and then put the lid back on the container to save it for another day. When you are ready to play with it again, add the water and dish soap back in, mix it all up, and it will be as good as new! I have the same question. Regular color sand is boring, but I cannot see buying kinetic sand at the store for the price they charge for it when we can make it at home for so much less! 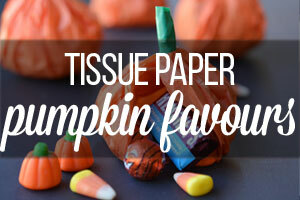 If we cannot use food coloring (staining hands issue? ), is there something else we can use to color the sand? I truly hope the writer of this article replies. 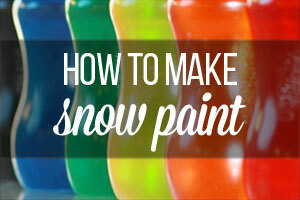 You can use food colouring but only in small amounts so it doesn’t stain anyone’s hands. We added food coloring to the cornstarch/sand and it worked well. Play sand means beach sand right. Or else separately play sand is there? It is just a finer grade. 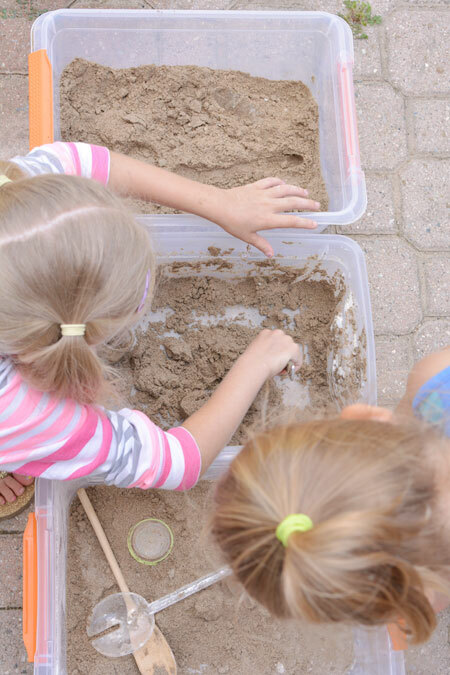 There is course sand for construction projects, and play sand is a finer sand that is better for kids. It is similar to beach sand. Aside from grain size, the differences in sand have to do with how pointy it is. Beach sand has generally been worn smooth & round by the waves and I think that’s what’s usually used for play sand. Construction sand is made by crushing rocks and it’s pointy, so it locks together and makes concrete & mortar stronger and more able to hold its shape, where beach sand is like a bunch of little ball bearings. 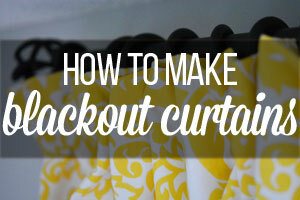 i am trying to do this but from marha stewart recipies and it is not working. when there is to much water i should add corn starch or just take a kitchen paper ?? if it is not working as kinetic sand, should i add more dish soap? i really don’t know why it is not working? Could you tell me something…if there is 1 cup of sand, then i should add 330ml or 200ml? This isn’t kinetic sand. It’s wet sand. Kinetic sand flows. This doesn’t; it just crumbles when handled. Very interesting. I combined cornstarch, sand, and hand soap and colored with food-safe dye in all shades of the rainbow. Kinetic sand is a great way to teach kids about color mixing. Interesting! Have never try it before. Will try with my kids this weekend. Thanks! That so so amazing.. Thanks for your posting. 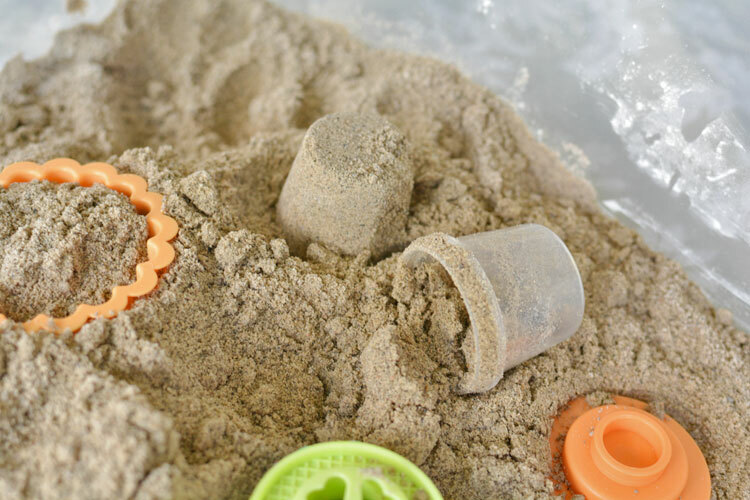 Surprisingly, this kinetic sand recipe is completely new to me but I have a plan to try this. Can you tell me will it work in dry sea beach? I am going to visit a sea beach next month. 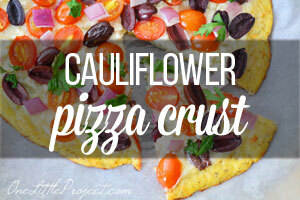 I have a plan, I will try this fascinating recipe with my friends together. Everyday i learn something new from you. 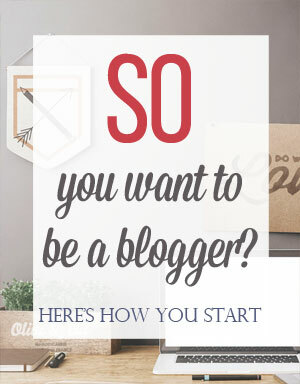 Thank you for being here! 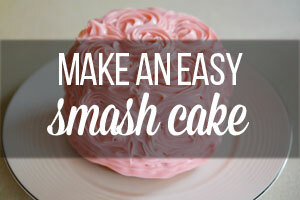 your recipes are wonderful and easy to make. 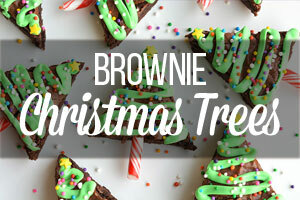 A great creation, I’m sure my kids will love them. Thank for sharing! 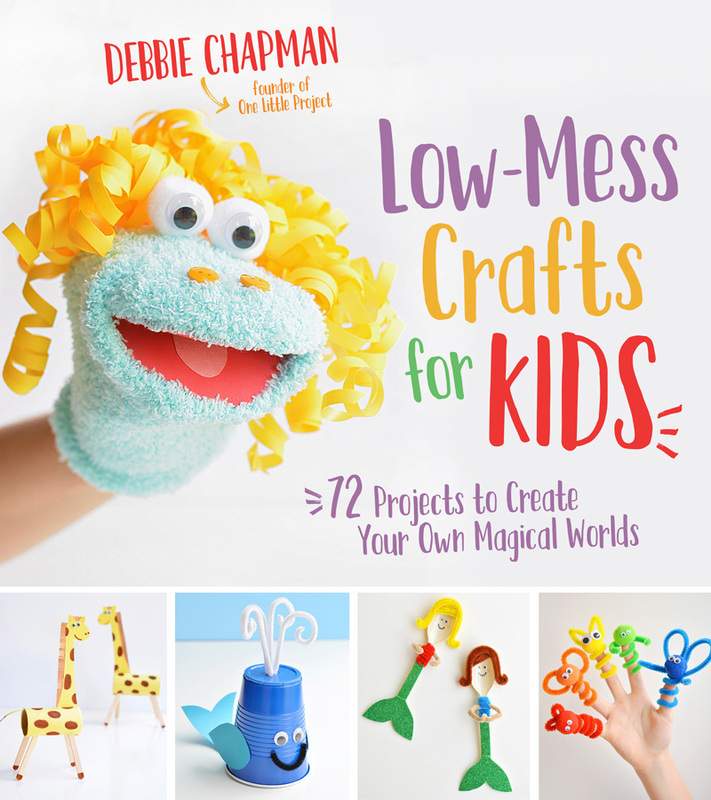 My kids loved it and I’m definitely going to buy :)) 5 stars for you and thanks so much for this guide Debbie! Thank you for sharing. I was really confused when using sand to play with my children.